Perfect your pout with the award-winning, Banana Balm Lip Sheen 3-in-1 from Lanolips, a lip balm that works to condition, smooth and add sheen. The luxurious, creamy formula is enriched with natural Banana extract and a host of Vitamins, Minerals and Antioxidants to help protect skin from environmental stresses. Its dose of the brand's exclusive Ultra Pure Medical Grade Lanolin (Nature's Wonder Moisturiser™ which has a molecular structure that closely resembles and mimics your own skin oils), combined with Shea Butter ensures lips are luscious, conditioned and shimmering. 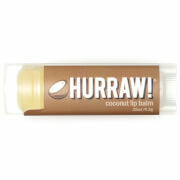 Delivering a subtle sheen, the multi-purpose balm leave lips lustrous and healthy-looking. Free from artificial fragrances, parabens, petrolatum, PEG’s, mineral oil and sulphates. Apply directly to lips as needed. Use generously. Lanolin, Butyrospermum Parkii (Shea Butter), Theobroma Cacao (Cocoa) Seed Butter, Beeswax (Cera Alba), Flavour (Aroma), Polyglyceryl-3 Diisostearate, Musa Sapientum (Banana) Fruit Extract, Ricinus Communis (Castor) Seed Oil, Tocopherol (Vit E), Silica, Titanium Dioxide (CI 77891), Mica, Tin Oxide (CI 77861), Calcium Aluminum Borosilicate.